First, I’d like to thank you for the kind comments left to Mr. SP and to me over the past week. You never expect to suddenly lose a loved one. We are trying to watch out for his dad and make sure that he is ok by himself. 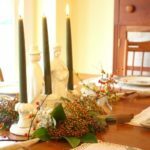 For the first time in 39 years, I won’t be celebrating Thanksgiving at either my grandmother or my mother’s home. 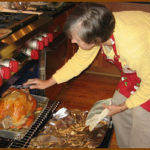 My mom expected to be the hostess for Thanksgiving, but her oven had other plans. A part was ordered for the oven, it came and was installed, but the oven is still not behaving correctly. Mama is loading her car with all of the food that she’s purchased and headed to my house to cook. It is going to be fun cooking together in my kitchen instead of hers. 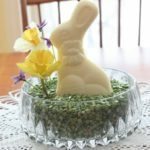 I feel so bad that she can’t have the meal at her home, but at least we have a plan B.
I found out yesterday afternoon that we would be celebrating here, so the first thing that I did was make a centerpiece and set the table. 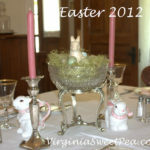 For the centerpiece, I had to use what I had. There was no time for flower shopping! 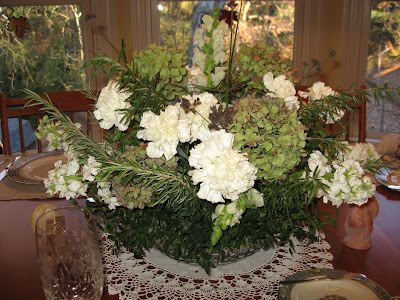 I used Snapdragon, Carnations, Verbena Bonaris, Rosemary, Boxwood, and dried Hydrangea. 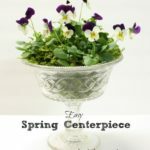 The container is one of my grandmother’s pressed glass serving bowls. The doily underneath was hand made by a relative, but I’m not sure who did it. I would guess that it is from the 1920’s or 30’s. I decided to use the silver that I inherited from my grandmother instead of my set. It actually belonged to the aunt that raised my grandmother and was a Christmas gift from my uncle. The card is still in the box! I also used a few pieces of engraved silver that belonged to Mr. SP’s grandparents. Would you believe that this was in a fishing box? 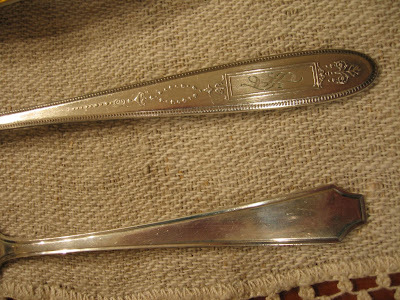 Mr. SP’s grandfather had three silver plated forks and knives in his tackle box. He was prepared to eat while fishing! When I discovered these pieces, they were black with tarnish. I was amazed at the pretty detail when I polished them. Mr. SP and his dad will use the silverware from the tackle box and the rest of us will use my great-great aunt’s silver. This is the gift card from “Uncle Dodie” that is still in the silver box. Dodie is a shortened form of his last name which was German. 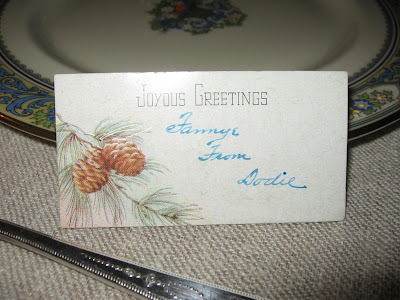 It is interesting that he spelled Aunt Fannie’s name as “Fannye”. There won’t be many of us around the table today. We will always miss my dad, my brother, and now my mother in law. I am very thankful for the family that I do have and intend to really enjoy the day in their company. I am especially looking forward to having Mama here with me. 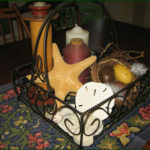 Happy Thanksgiving-sounds like everyone will have a wonderful time at your beautiful home. How wonderful that you have your mom to cook with, even though things are a bit different today. I hope for you and your family that it is a wonderful day. Your table looks spectacular for pulling it together at the last minute! LOVE that arrangement you made!! happy Thanksgiving! Your table is so pretty. 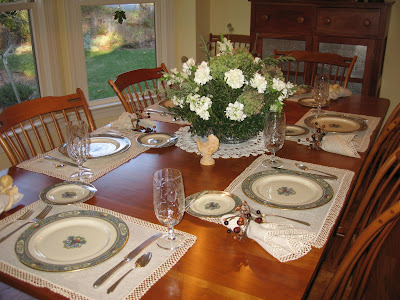 Love your china and how special to have family heirlooms in use! I have the same china pattern! I love it. 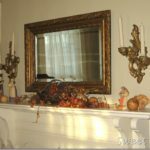 Where did you get your background for your blog?